Breast cancer heterogeneity reflects the complex biology of this disease. Breast cancer subtypes, as identified either by immunohistochemistry (IHC) or by gene expression analysis, present different molecular characteristics and prognosis. In this context, molecular imaging techniques providing functional information, contribute in evaluating response to treatment and long-term prognosis among different subtypes. Nuclear imaging diagnosis modalities play an important role for conducting research on cancer biology and developing new treatment approaches. 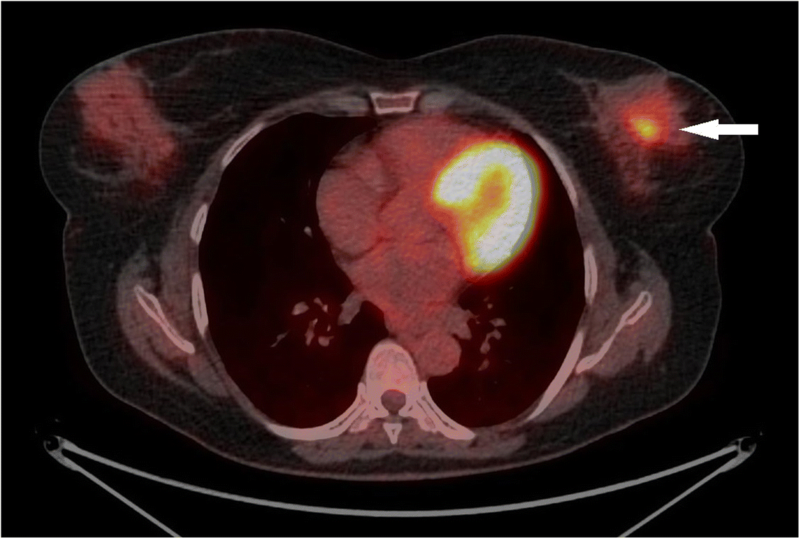 Positron Emission Tomography (PET) is a radionuclide based imaging method that has the potential to locate the tumor, define its staging, and monitor its response to treatment. In the current study, we will review the utility of the most widely used molecular imaging technique, 18F-fluorodeoxyglucose (18F-FDG) PET, in order to determine the relationship between standardized uptake values (SUVs) and immunohistopathological factors, as well as to clarify whether PET is able to predict breast cancer phenotypes. Moreover, we will discuss the rising development of new radiopharmaceuticals in PET imaging, such as 18F-fluoro-17-estradiol (FES), 18F-fluoro-l-thymidine (FLT), 18F-fluoromisonidazole (FISO), and 89Zr-immuno-PET, which give more information about tumor characteristics. In order to improve clinical decision making, enabling hereafter more successful individualized therapies, it is imperative to combine PET radiopharmaceuticals and imaging techniques of critical biologic and pathologic phenomena, including ER, PR and HER2 expression, angiogenesis, hypoxia, apoptosis and metabolic changes in the microenviroment of breast tumors. Breast cancer is the most frequently diagnosed noncutaneous malignancy in women worldwide, accounting for approximately 30% of all new cancer diagnoses and about 14% of all cancer deaths in women. About 63,410 new cases of female breast carcinoma in situ and 252,710 new cases of invasive breast cancer will be diagnosed in 2017 among United States (US) women. It is estimated that one in eight women will develop breast cancer during their life, while it is the second most common cause of cancer death among women. Although breast cancer’s mortality is reduced during the past three decades, its incidence is rising and the outcome is still fatal in several cases (American Cancer Society, 2017). The most widely used cancer staging system TNM (Tumor-Nodal status-Metastasis) categorizes breast tumors according to the size of the tumor (T), the number of infiltrated lymph nodes (N) and the presence or not of metastasis (M) (Elston & Ellis, 1993; Sobin et al., n.d.). Moreover, clinicopathological parameters, recognized as traditional prognostic indicators, are menopausal status, age, tumor size, histological grade, lymphovascular invasion, Ki-67 and tumor lymphocytic infiltrations (Elston & Ellis, 1993; Sobin et al., n.d.; de Ajambuja et al., 2007; Soerjomataram et al., 2008). Further prognostic information provides the histological type of the tumor. Invasive ductal carcinoma (IDC) not otherwise specified (NOS) represents the majority of breast carcinomas, (about 75% of cases), while invasive lobular carcinoma (ILC) is the second most frequent type (about 10% of cases). Rare histopathological types of breast cancer, exhibiting favorable prognosis, include adenoid cystic, medullary, mucinous, and tubular carcinoma. Apocrine and metaplastic carcinomas have similar 10-year survival with IDC NOS and ILC (Li et al., 2005; Weigelt et al., 2010; Arpino et al., 2002; Diab et al., 1999). Over the past twenty years, our understanding and treatment of breast cancer has undergone a metamorphosis, shifting from a generally homogeneous to a more individualized approach. With regard to the latter, hormone receptor (HR) status together with HER2/neu (human epidermal growth factor receptor 2) status designation have contributed the most. ER (estrogen receptor) and PR (progesterone receptor) positivity is defined as the presence of at least 1% positive tumor nuclei for ER and PR respectively, while HER2 positive status is defined when (on observing within an area of tumor that amounts to > 10% of contiguous and homogeneous tumor cells) there is evidence of protein overexpression immunohistochemistry (IHC) or gene amplification (HER2 copy number or HER2/CEP17 ratio by in situ hybridization (ISH) based on counting at least 20 cells within the area). In case results are equivocal (revised criteria), reflex testing should be performed using an alternative assay (IHC or ISH) (6-HRguidelines, 7-Wolff HER2 recommendations). Patients with HR positive and/or HER2 positive tumors benefit from endocrine therapies such as tamoxifen and aromatase inhibitors, and/or anti-HER2 therapies such as trastuzumab and pertuzumab, respectively (Wolff et al., 2013). Most of the above mentioned factors are combined in the form of algorithms for clinical practice and treatment decision making, such as Adjuvant! Online and the Nottingham prognostic index (Ravdin et al., 2001). In parallel with this, the development of gene expression microarray technology was a great evolution and brought the concept of breast cancer heterogeneity to the forefront of cancer research. Gene expression analysis has categorized breast cancer into five subtypes based on the “intrinsic” profile of primary tumors, namely basal-like, luminal A and B, HER2 and normal-like (Perou et al., 2000). These subtypes are associated with different prognostic outcomes, whereas it is believed that normal-like does not represent cancerous tissue. In general luminal subtypes show more favorable prognosis than the other subtypes, whereas basal-like subtype displays the worst outcome. Recently, several gene signatures, providing prognostic and/or predictive information, have been developed, such as Oncotype DX and Mammaprint (McVeigh et al., 2014; Cardoso et al., 2016). The variability in clinical course of this disease appears to reflect its complex biology and heterogeneity. There are still patients with early stage breast cancer who undergo adjuvant chemotherapy without benefit, facing its side effects. Furthermore, a number of different combinations of therapies exist for patients with metastatic breast cancer, making imperative the need for early response evaluation. New therapeutic options, diagnostic and prognostic tools need to be continuously expanded for the optimal treatment decisions and care for patients with breast cancer. Nuclear medicine holds primary diagnostic role in the management of breast cancer patients in all stages of the disease (Magometschnigg et al., 2014). 18F-fluorodeoxyglucose (18F-FDG) is the most commonly used agent for positron emission tomography (PET) imaging. PET/computed tomography (PET/CT) with 18F-FDG has been widely utilized for the diagnosis, staging and restaging of different types of cancer, including breast cancer. Breast cancer is associated with increased glucose consumption and can therefore be visualized with the glucose analogue 18F-FDG and PET. FDG uptake in the primary tumor can vary substantially, and specific tumor characteristics have been demonstrated to determine the degree of glucose metabolism. Specifically, the expression of glucose transporter Glut-1 and hexokinase I, the number of tumor cells that are viable per volume, the histological subtype, the tumor grade, the microvessel density and the proliferative activity of the tumor are some of the major factors that highly affect the FDG uptake in breast cancer. (Buck et al., 2004). PET holds a decisive role in the detection of distant metastases, tumor recurrence and evaluation of therapeutic response, while it has a limited diagnostic value as compared with other imaging methods, regarding the diagnosis of primary breast lesions and locoregional staging (Iakovou & Giannoula, 2014). Recently there is increasing interest in deriving the metabolic active tumor volumes (MATVs) and total lesion glycolysis (TLG) metrics. SUV and MATV can be used as biomarkers for diagnostic or prognostic purposes, but their main use is therapy monitoring of antineoplastic treatments. The use of these metrics to evaluate response to a given treatment is based on the fact that the observed changes in tumor uptake are greater than that due to inherent statistical fluctuations (Aide et al., 2017). Therefore, the advantage of imaging with 18F- FDG PET/CT, compared to other conventional imaging methods (mammography, scintigraphomammography, radiological mammography, breast ultrasound, magnetic single mammogram), is the capability of imaging biological processes, at a cellular and molecular level (Riegger et al., 2012). According to the National Comprehensive Cancer Network (NCCN) clinical practice guidelines in oncology for breast cancer version 2. 2017 the use of FDG PET/CT is not indicated in the staging of clinical stage I, II, or operable stage III breast cancer. The recommendation against the use of PET scanning is supported by the high false-negative (FN) rate in the detection of lesions that are smaller than 1 cm and/or low grade, the low sensitivity for detection of axillary nodal metastases, the low prior probability of these patients having detectable metastatic disease and the high rate of false-positive (FP) scans. However, it is most helpful in situations where standard staging studies are equivocal or suspicious, especially in the setting of locally advanced or metastatic disease. It may also be helpful in identifying unsuspected regional nodal disease and/or distant metastases in locally advanced breast cancer when used in addition to standard staging studies (Gradishar et al., 2017). In addition, PET imaging appears to have a major contribution to cases with increasing tumor markers without any confirmed sign of recurrence by other imaging methods (Karantanis et al., 2012). Providing that conventional imaging methods, have some limitations regarding the molecular approach of breast carcinomas, new imaging methods have been widely utilized. However, the need for more information regarding the classification of tumors into specific molecular subtypes, that enables the therapeutic planning, has been the initiative to review the contribution of PET/CT in the evaluation of histological and immunohistochemical findings in breast carcinomas. As long as 18F-FDG is not specific radiotracer for neoplasms several non malignant conditions may mimic breast cancer (primary tumor, locally advanced or metastatic disease). Acute and chronic inflammation, physiologic lactation, and benign breast masses and postsurgical changes, may show increased FDG uptake on PET/CT. These conditions can often be differentiated from malignancy by correlative imaging, including mammography, sonography, MRI or by dual-point FDG imaging (Adejolu et al., 2012; Kumar et al., 2009). Several studies show that the uptake of FDG in malignancies, continues to increase for hours after radiopharmaceutical injection, and this difference could be useful to improve the accuracy of PET to distinguish benign lesions from malignant ones. A lesion is likely to be malignant if the SUV increases over time, whereas it is likely to be benign if the SUV is stable or decreases (Schillaci, 2012). Breast cancer lesions were imaged twice at approximately 63 min and 101 min after the administration of FDG in Basu et al. prospective study, showing strong evidence that dual-point acquisitions (early and delayed) may improve the specificity of FDG imaging in cancer including breast neoplasms (Basu et al., 2008). Quantitative PET/CT has been used in several studies not only as a diagnostic and prognostic tool, but also for therapy monitoring. Associations between SUV and clinicopathological features and immunohistochemical factors have been demonstrated in previous studies. Jung et al. (2015) evaluated the associations between the maximum SUV (SUVmax) and prognostic factors in ILC, comparing these results with those in IDC. In particular, regarding the histological subtype they observed that the lowest mean SUV max was found among patients with ILCs in comparison with IDCs tumors. Actually, the former did not also presented any relationship between the SUV max uptake and the tumor size as opposed to IDCs tumors. In addition, higher SUV max was clearly determined among non hormone sensitive IDCs tumors with higher tumor grade, epidermal growth factor receptor (EGFR) positivity and proliferation index (Ki-67) positivity. Finally, both PR and HER-2 status did not indicate any significant difference given the SUV max uptake between ILCs and IDCs tumor groups. (Jung et al., 2015). In agreement with the foregoing, numerous studies in primary breast cancers have demonstrated statistically significant associations between higher values of maximum SUV and histological type (IDC), histological grade (III), tumor diameter, mitotic index, Ki-67 expression, nuclear atypia, hormone receptor (HR) negativity, high score of HER2 expression, lymph node metastasis all related to breast carcinomas’ higher aggressiveness and more unfavorable prognosis (Fig. 1) (Bitencourt et al., 2014; Lavayssière et al., 2009; Kitajima et al., 2015; Ueda et al., 2008). On the contrary, Shimoda et al. showed a significant association between SUV values and mitotic counts, Ki-67, and nuclear grade, but not with tumor size, age, histology, HR expression and HER2 overexpression (Shimoda et al., 2007). Moreover, higher SUV values have been correlated with outcomes such as higher relapse and mortality rate (Gil-Rendo et al., 2009; J Avril et al., 2001; Crippa et al., 1998). In conclusion, several studies confirm that PET has the potential to identify more aggressive early breast carcinomas and may be a useful prognostic tool, indicating that it should be considered as a supplementary staging procedure and in the recurrence risk assessment of breast cancer patients (Soussan et al., 2014; Koolen et al., 2012a; Miyake et al., 2014; Choi et al., 2012; Cochet et al., 2012) (Fig. 2). In this context, Heudels’ study (2010) provided valuable insight into the usefulness of FDG-PET/CT for preoperative staging of patients with triple-negative and poorly differentiated breast tumors as well (Heudel et al., 2010). Transverse image of 18F-FDG PET/CT in patient with breast cancer. Representative transverse image in patient with HR negative IDC, with high score of HER2 expression and Ki 67 of 30%. PET/CT shows primary tumor of the left breast (SUVmax = 7.4). Classification after PET/CT was T1cN0M0. With the permission of the Third Department of Nuclear Medicine, Medical School, Aristotle University of Thessaloniki, Papageorgiou General Hospital, Thessaloniki, Greece. FDG: Fluorodeoxyglucose, IDC: Invasive ductal carcinoma, HR: Hormone receptor, HER2: Human epidermal growth factor receptor 2, Ki-67: Proliferation index, SUV: Standardized uptake value. The past decade, 18F-FDG uptake has been well correlated with the newly defined breast cancer molecular subtypes as determined by IHC. In 2008, Basu et al. reported very high sensitivity of FDG-PET imaging in detecting triple-negative breast tumors, irrespective of Ki-67 expression, with high FDG uptake being correlated with triple negative breast cancer (TNBC), commensurate with its aggressive biology (Basu et al., 2008). Two years later, Tchou et al. showed that the degree of tumor FDG uptake correlated significantly with proliferation index in women with TNBC than nonTNBC, 95.5% vs 68.4% respectively, suggesting a potential role of FDG-PET in treatment response monitoring for this group of women (Tchou et al., 2010). The association between HER2 status and SUV has been extensively studied the past years, leading to conflicting results. Several studies report strong correlations between higher SUVmax and overexpression of HER2 (Sanli et al., 2012; Koo et al., 2014). On the other hand, other research groups found no significant correlation between the tumor SUVmax and HER2 immunohistochemical overexpression, (Ekmekcioglu & Aliyev, 2013; Osborne et al., 2010; Mavi et al., 2007). More recently, higher SUV max values were seen in patients with locally advanced breast cancer (stage II and III), younger age and non luminal/HER2 positive and TNBC compared to luminal A groups (Tural et al., 2015). In line with the above, Ohara et al. found higher uptake of SUV in patients with HER2 positive and negative hormone status (Ohara et al., 2013). Similar results have also been illustrated by Kadoya et al. in 344 patients, demonstrating higher SUV uptake among HR negative/HER2 positive patients, with the highest SUV values in TNBC patients independently of their subtype (Kadoya et al., 2013). Moreover, higher SUV uptake was also associated with lower relapse-free survival (RFS). Another recent study of great interest comes from Cokmert et al. in the metastatic setting, where higher SUV max uptake was determined among patients with HER2 positive and TNBC subtypes, while SUV max value predicted a relationship between metastatic sites and overall survival (Cokmert et al., 2016). As far as luminal subtypes is concerned, both in the adjuvant and metastatic setting, two studies by Zhang et al. and Higuchi et al., showed similar results, namely weakness of SUV max uptake to differentiate luminal A from luminal B subtypes. However, they succeeded in highlighting the competence of SUVmax uptake to predict progression-free survival (PFS) and disease-free survival (DFS) rates (Zhang et al., 2013; Higuchi et al., 2016). In the last study though, combination of Ki67 and SUVmax appeared to be useful for selecting patients who have inferior prognosis and need further adjuvant treatment, which is the biggest dilemma for physicians treating patients with luminal carcinomas. According to our knowledge, there is no published study performed in patients correlating 18F-FDG-PET imaging characteristics with breast cancer molecular subtypes, as determined by gene expression analysis. We found only one study performed in human TNBC cell lines, which showed that 89Zr-Transferrin PET compared to 18F-FDG PET targets human TNBC primary tumors significantly better (Henry et al., 2018). It is now well known that the prognostic value of IHC defined breast cancer subtypes, especially of luminal subtypes, is problematic, with many cases presenting a different clinical course than expected according to their IHC categorization. Furthermore, gene expression analysis and molecular subtyping is difficult to apply in daily practice due to cost and infrastracture availability. Not to forget, the majority of the studies have been carried out retrospectively, diminishing their power to draw conclusions. Finally, 18F-FDG PET, at the time being, cannot be safely used to predict breast cancer molecular subtypes. Further validation in prospective studies with larger numbers of patients, is required to establish a robust molecular signature for metabolic uptake and patterns of aggressive behavior in breast cancer. Nowadays, the rapid increase of alternative therapeutic strategies impose early assessment of tumor response to therapy and better selection of the therapeutic approach, improving the survival outcome and avoiding unnecessary toxicity. Groeux et al. evaluated the potential role of PET/CT to demonstrate earlier surgical outcomes in patients with locally advanced HER2 positive breast carcinomas after the initiation of two cycles of neoadjuvant chemotherapy. All patients underwent 18FDG PET twice, before and after the second cycle of chemotherapy. It was found that patients with higher 18FDG PET uptake after 2 cycles of chemotherapy had finally more residual disease and consequently worse response to therapy. Accordingly, predicting those patients who seem to achieve less tumor response with the neoadjuvant treatment plan might lead to improved clinical benefit through the earlier modification of the treatment plan and the addition of alternative chemotherapeutic regimens (Groheux et al., 2013). In addition, the same research team, published another study with similar design about the role of 18FDG PET to predict earlier those tumors which present more chemosensitivity and thus higher response in patients with ER positive / HER2 negative breast carcinomas. They examined two different PET parameters, SUV and TLG, revealing finally a significant association and higher predictive value between pathological response and TLG. Actually, they observed higher response rate among patients with luminal B and PR negative tumors. Τhereafter, the earlier prediction of less tumor response in patients with luminal A subtype might be more effective to stratify in time optimal alternative therapeutic strategies, that potentially offer higher benefit to this patient population (David Groheux Hatt et al., 2013). Furthermore, Gebhart et al. aimed to highlight the value of 18FDG PET as a full promised tool to predict early pathological Complete Response (pCR) to neoadjuvant therapy with lapatinib, trastuzumab and their combination in women with HER2 positive carcinomas. 18FDG PET was performed at baseline and after 2 and 6 weeks of antiHER2 treatment. They found that the greater SUV reduction, the higher pathological response rate at surgery. Characteristically, regarding the HR status, patients with HR positive tumors presented lower metabolic response rate and accordingly much lower pCR at surgery (Gebhart et al., 2013). Hence, using 18FDG PET as a predictive tool of response to neoadjuvant antiHER2 treatment, could be proved fairly useful. Therefore, 18FDG PET seems to be a high promising predictive tool to neoadjuvant treatment, identifying those patients need to receive further alternative anticancer treatment. In the era of individualized medicine, the need for the development of new PET radiopharmaceuticals, that enable HRs’ and HER2 status designation as well as the determining of DNA synthesis, angiogenesis’, apoptosis’ and metabolism’s imaging, has become more imperative than ever. In this context, 18F-FDG as a general indicator of glucose consumption remains the cornerstone of PET imaging in breast cancer, while several other radiopharmaceuticals are constantly being developed, serving as diagnostic and prognostic tools in the research of breast tumors (Table 1). ER-positive breast cancer is the most common subtype of breast cancer. Major progress has been made in endocrine therapies that target the dependence of this subtype on the ER (Turner et al., 2017). Biopsy might be useful to reassess a patient’s ER status, but is not always feasible, either due to technical reasons or due to intra-tumoral heterogeneity of ER expression, which correlated with morphologically distinct areas in the tumor (Hodi et al., 2007). Moreover, ER expression can change over time, and discordant expression between primary tumors and metastases may be seen. Therefore, this progress presupposes advances in the imaging of functional ER expression in vivo. PET with 16α-[18F]-fluoro-17β-oestradiol (18F-FES) enables non-invasive visualization and quantification of ER expression in all tumor lesions within a patient. In addition, this imaging technique can potentially provide in-vivo information about ER binding of endocrine drugs. (van Kruchten et al., 2013). Since 1988 several studies have shown that FES PET can reliably detect ER+ tumor lesions and that FES uptake is well correlated with immunohistochemical scoring for ER (Dehdashti et al., 1995; Linden et al., 2006; Peterson et al., 2008; Peterson et al., 2011). Mintun et al. in 1988 enrolled 13 patients with primary breast masses, showing an excellent correlation between FES uptake within the primary tumor and the tumor ER concentration measured in vitro after excision (Mintun et al., 1988). Sun Y in 2015 investigated the contribution of FES PET/CT in determining ER positive metastatic lesions from breast cancer, suggesting that 18F-FES PET/CT by assessing the entire tumor volume receptor status, it may be used to assist the individualized treatment decisions of breast cancer patients (Sun et al., 2015). Paquette et al. (2017) took ER imaging a step forward by their phase II clinical trial, which was conducted to compare the PET imaging diagnostic potential of 4-fluoro-11β-methoxy-16α-[18F] fluoroestradiol (4FMFES) to FES in ER positive breast cancer patients. They found that 4FMFES-PET achieves lower non-specific signal and better tumor contrast than FES-PET, promising improved diagnostic confidence and lower false negative diagnoses (Paquette et al., 2017). Because expression of the PR is an estrogen-regulated process, the primary focus was on the development of ER-targeted radiotracers. However, a number of PR-targeting radiotracers have been synthesized and investigated in preclinical and clinical studies. The most successful PR-targeted radiotracer is the progesterone analog 21-18F-fluoro-16α,17α-[(R)-(1′-α-furylmethylidene)dioxy]-19-norpregn-4-ene-3,20-dione (18F-FFNP) (Dalm et al., 2017). The first-in-human study designed to evaluate the feasibility of imaging tumor PRs by PET in breast cancer as well, the safety and dosimetry of 18F-FFNP, was conducted by Dehdashti F et al. in 2012 (Dehdashti et al., 2012). Although, they did not found significantly different SUVmax in PR+ and PR- cancers, they documented a significantly greater tumor to normal breast ratio (T/N) in the PR+ cancers. They also reported relatively small absorbed doses to normal organs, suggesting that 18F-FFNP PET is a safe, noninvasive means for evaluating tumor PRs in vivo in patients with breast cancer (Dehdashti et al., 2012). Preclinical studies investigating the potential of 18F-FFNP PET imaging to predict response to anti-estrogen treatment have been performed with promising results as well. Indeed, Chan et al. (2015) demonstrated that serial FFNP-PET imaging was more effective than FDG-PET and FES-PET in predicting response to estrogen deprivation therapy in preclinical models of ERα + breast cancer, introducing its role in a neoadjuvant setting so that a more aggressive treatment course can be implemented after surgery if the primary tumor is predicted to be endocrine-nonresponsive (Chan et al., 2015). HER2 overexpression affects 20–25% of breast cancer patients, conferring a worse prognosis. Imaging modalities that target HER2 have the potential not only to diagnose HER2-positive breast cancer, but also detect distant metastases via a single, noninvasive procedure. In addition, HER2 status determines choice and response to therapy but can change in response to treatment and during disease progression. Radiolabeled immunoglobulins (trastuzumab and pertuzumab), immunoglobulin fragments, F(ab´)2, diabodies, nanobodies and nonimmunoglobulin scaffolds, affibody and designed ankyrin-repeat proteins devise a reliable and quantitative method for detecting HER2-positive cancer using PET (Goldstein et al., 2013). Trastuzumab is a monoclonal antibody that targets HER2, which is used in HER2-positive breast cancer therapy. Imaging modalities have been constructed using a functionalized version of this antibody. 89Zr and 64Cu radiopharmaceuticals (89Zr-DFO-trastuzumab, 64Cu-DOTA-trastuzumab) are an attractive option for antibody-based imaging agents due to their compatible half-life and they proved to be promising in detecting not only primary tumor, but also metastatic disease that conventional PET was unable to accomplish (Henry et al., 2017). Following initial studies on animals, Beylergil et al. (2013) published their clinical experience in the assessment of the toxicity, pharmacokinetics, biodistribution, and dosimetry profile of 68Ga-1,4,7,10-Tetraazacyclododecane-N,N′,N″,N″‘-tetraacetic acid (DOTA)-F(ab’)2-trastuzumab [68Ga-DOTA-F(ab’)2-trastuzumab] with PET/CT in a group of 16 women with breast cancer. Although, they showed that radiation dosimetry and pharmacokinetics were favorable and determined its safe use, they found no tumor uptake of the radiolabeled F(ab´)2 in most cases, which was attributed to suboptimal protein dose of F(ab’)2-trastuzumab and possible interference with high circulating levels of trastuzumab (Beylergil et al., 2013). Munnink and colleagues (2014) tried to put forth some additional considerations, doubting whether a higher protein dose of 68Ga-DOTA-F(ab’)2-trastuzumab will improve the results in all patients, while they pointed out the significance of defining assessing HER2 status in the primary tumor or in recurrent disease lesions in the final results (Oude Munnink et al., 2014). The need for labeling a molecule that does not interfere with the current therapeutic agents has led to the construction of ABY-025, a small reengineered affibody molecule targeting a unique epitope of the HER2 receptor. Baum RP et al. (2010), followed by other researchers, investgated molecular imaging of HER2-expressing malignant tumors in breast cancer patients using synthetic 68Ga-labeled affibody molecules, with quiet promising results (Baum et al., 2010; Tolmachev et al., 2010; Sörensen et al., 2014). Additionally, radiolabeled HER2-targeting nanobodies that can be labeled with different radionuclides (18F, 68Ga) were synthesized and applied for HER2 visualization. The majority of these nanobodies are still under investigation in a preclinical setting (Mintun et al., 1988). PET imaging of proliferation, angiogenesis, and DNA damage and repair offers the opportunity to monitor therapeutic efficacy, to detect changes in tumor biology that may precede physical size reduction and simultaneously allows the study of intratumoral and intertumoral heterogeneity. Cell proliferation imaging has long been a goal of nuclear medicine research, and most of the effort has focused on radiotracers of DNA synthesis. Several agents have been proposed for PET imaging of DNA synthesis, including 18F-fluorothymidine (FLT), 76Br-bromodeoyxuridine, 11C-thymidine, and derivatives of mdeoxy-18F-fluoroarabinofuranosyl such as 18F-FAU, 18F-FMAU, 18F-FBAU, and 18F-FIAU. Among all these radiotracers mainly tested in clinical studies, FLT has emerged as the most promising PET tracer in recent studies (Cervino et al., 2013). Crippa et al. (2015) suggest the potential utility of FLT PET scans for early monitoring of response to neoadjuvant chemotherapy and to formulate a therapeutic strategy (Crippa et al., 2015). Thymidine is the only nucleotide incorporated into DNA but not RNA, therefore most proliferation markers have concentrated mainly on thymidine analogs. 2-11C-thymidine was one of the first proliferation probes. Promising results were seen in early studies, however, this probe has generally been abandoned because of the short half-life of 11C, its rapid metabolism, and complex modeling analysis that is required. 1-(29-deoxy-29-fluoro-b-D-arabinofuranosyl) thymine (FMAU) is another thymidine analog that has been developed for use in PET studies. Novel 18F-benzamide analogs are also being developed as proliferation probes (Kenny, 2016). However, further clinical studies, recruiting larger groups of population, are needed in order to evaluate the preliminary results of these studies. αvß3-integrin is an endothelial and tumor cell receptor which is overexpressed by angiogenic endothelium and tumor cells and holds a significant role in angiogenesis of breast cancer. It is a receptor for the extracellular matrix proteins with the exposed arginine-glycine-aspartic acid (RGD) tripeptide sequence and therefore RGD peptides can preferentially bind to integrin αvβ3. The development of PET radiolabeled RGD tracers started with 18F-galacto-RGD, which was the first to be used in humans. Since then, also other RGD PET tracers have been developed [including 68Ga-1,4,7-triazacyclononane-1,4,7-tris[(2-carboxyethyl) (methylenephosphinic acid]) (TRAP)-(RGD)3, 68Ga-1,4,7-triazacyclononane-1,4-bis(acetic acid)(NODAGA)-RGD] has enabled the specific targeting of αvß3-integrin (Kazmierczak et al., 2016; Mankoff et al., 2007). Beer et al. were among the first study groups investigating αvβ3 expression by 18F-Galacto-RGD PET, exclusively in primary and metastatic human breast cancer. Although their survey included a small group of patients (15), they identified all invasive carcinomas, lymph-node metastases in 3 of 8 patients while SUVs distant metastases were heterogeneous, describing as promising its use in the assessment of angiogenesis or planning of αvβ3-targeted therapies (Beer et al., 2008). In 2016 Chen et al. reviewed the clinical applications of radiolabeled RGD peptides for PET maging of integrin αvβ3 revealing its contribution not only to the detection of malignant lesions and tumor staging but also to patient risk stratification and patient selection for antiangiogenic therapy, as well as therapy response monitoring. Therefore they introduced them as a precious diagnostic and prognostic tool for breast cancer (Chen et al., 2016). Another important hallmark of cancer disease is hypoxia. Noninvasive imaging of the oxygenation status and heterogeneity of hypoxia tends to get imperative for the assessment of the aggressiveness and therapy response in breast cancer. Fluoromisonidazole (FMISO) labeled with H-3 or F-18 has been tested as a quantitative probe for hypoxic cells since 1989 (Rasey et al., 1989). The constant development of new radiopharmaceuticals such as 18F-fluoroetanida-zole (FETA), 18F-fluoroazomycinarabinoside (FAZA) and 64Cu-diacetyl-bis-N(4)-methylthiosemicarbazone (ATSM) and the conduction of studies comparing their accuracy conclude that they can be helpful for improving treatment outcome. Most of those studies though, are experimental or include small groups of patients with breast cancer (Rajendran, 2005; Barthel et al., 2004). Apoptosis is a normal, physiological, genetically directed process of cell self-destruction. Ιt is involved in the etiology and pathology of numerous major diseases including cancer. In addition chemotherapy induced apoptosis is regarded as being an indicator of tumor response to therapy (Hu et al., 2012). Annexin V is a human protein with nanomolar affinity for cell membrane-bound phosphatidylserine (PS) and it is the most widely used conjugate for the detection n of apoptosis by using PET (Yeh et al., 2017). The most well-studied PET imaging probe for the visualization of characterization and measurement of apoptosis is 18F-annexin V, originally synthesized by Zijlstra et al. in 2003 (Zijlstra et al., 2003). Since then several 68Ga-labeled annexin V compounds have been developed including 68Ga-Dotamaleimide-conjugated Cys2-annexin V and 68Ga-Dotamaleimide-conjugated Cys165-annexin V, as an alternative to 18F because of its radiophysical properties (Bauwens et al., 2011). Further efforts have been necessary to develop lower-molecular-weight probes, including 18F-labeled 2-(5-fluoro-pentyl)-2-methyl-malonic acid (ML-10), other imaging apoptosis with PS binding peptides and small molecules, probes that target the collapse of mitochondrial membrane potential (ΔΨm), such as 18F-fluorobenzyl triphenyl phosphonium (18F-FBnTP) which serve as a hallmark of the initiating phase of apoptosis as well as radiolabelled capsases -intracellular cysteine aspartate-specific proteases that play an important role in the initiation and execution of apoptosis- including 1-[4-(2-18F-fluoroethoxy)-benzyl]-5-(2-phenoxymethyl-pyrrolidine-1-sulfonyl)-1H-indole-2,3-dione (18F-WC-II-89), 18F-labeled isatin analog (S)-1-[[1-(2-fluoroethyl)-1H-[1,2,3]triazol-4-yl]methyl]-5-[2-(2,4-difluorophenoxy)methyl-pyrrolidine-1-sulfonyl]isatin ([18F]ICMT-11) (Madar & Huang, 2009; Niu & Chen, 2010; Ogawa & Aoki, 2014). Although, surveys investigating the relationship between 18F-FDG uptake annexin V imaging have demonstrated a correlation between an enhanced apoptotic reaction (increased radiolabeled annexin V uptake) with suppressed tumor glucose utilization (decreased FDG uptake), Mortimer et al. (2001) demonstrated increased 18F-FDG uptake after hormonal therapy administrated for estrogen receptor–positive breast cancer (Mortimer et al., 2001). Their observations described as flare phenomenon, owing to energy consumption initially, lead to a temporal increase in glucose demand (Blankenberg, 2009). Changes in energy requirements and metabolism are hallmarks of breast cancer growth, herein, alternative metabolic tracers –other than 18F-FDG- have been developed in order to assess those changes in patients with breast tumors. Elevated levels of choline (trimethyl-2-hydroxyethylammonium) and choline kinase (CK) activity in neoplasms have been the intrinsic for the development of choline labeled analogs. From DeGrado et al. in 2001 who synthesized and studied (18F)fluorocholine (fluoromethyl-dimethyl-2-hydroxyethylammonium [FCH]), (18F)fluoromethyl-methylethyl-2-hydroxyethylammonium (FMEC), (18F)fluoroethyl-dimethyl-2-hydroxyethylammonium (FEC), and (18F)fluoropropyl-dimethyl-2-hydroxyethylammonium (FPC) choline analogs, via Kenny LM et al. (2010) who studied the response to therapy with trastuzumab in patients with breast cancer using (11C)choline-PET, to Tateishis’ working group (2012) who compared the effectiveness between 18F-FDG and (11C)choline-PET in 74 patients with breast cancer, they all demonstrated high sensitivity of choline labeled analogs PET imaging, since it make feasible the detecting of metabolic changes within tumors (DeGrado et al., 2001; Kenny et al., 2010; Tateishi et al., 2012). Whole-body PET/CT scanners have a limited ability to depict small lesions or lymph node micrometastases, and they cannot be used to rule out breast cancer in women with suspicious or doubtful findings. Recently, in an attempt to overcome these limitations, a PET imaging system exclusively for breast imaging has been developed. Positron emission mammography (PEM) is a new breast-dedicated device that promises to obtain a more accurate metabolic evaluation of breast lesions, thanks to a reduced distance between a patient’s breast and the detection plates and therefore higher resolution than that of the wholebody technique (Pinker et al., 2011). PEM is equipped with two parallel photon detectors in a configuration similar to mammography compressors. As an organ-specific instrument, it can provide high spatial resolution compressed-breast images. In initial studies, the sensitivity of PEM was reported to be about 90% (Eo et al., 2012). The application of PEM in clinical routine is limited, however, according to Caldarella et al. meta-analysis PEM using FDG is a really sensitive and specific tool for the evaluation of suspicious breast lesions, while the detection of additional lesions and extensive intraductal involvement is improved as well. Its diagnostic performance is superior to that of conventional mammographic and ultrasonographic imaging, and comparable to that of MRI in the depiction of invasive breast cancers (Caldarella et al., 2014). In order to overcome missing lesions close to the pectoral muscle because of compression of the breast, other dedicated breast PET techniques were introduced including MAMmography with Molecular Imaging (MAMMI) PET (Koolen et al., 2012b). MAMMI PET is a high-resolution breast PET for hanging breast molecular imaging, was showed to have higher sensitivity for primary breast cancer lesions within the scanning range of the device, compared to PET/CT (Teixeira et al., 2016). Moreover, MAMMI PET proved to be superior to PET/CT in evaluating heterogeneity of primary tumor (18)F-FDG uptake in breast cancer, offering a rationale for (18)F-FDG-guided biopsies (Koolen et al., 2014). Although, integrated PET/CT and dedicated breast techniques provide high-resolution images with good anatomic details, it also has its limitations. The combination of morphological high-resolution data of MRI with the functional data offered by PET in PET/MRI integrated systems, aims to overcome these limitations. The functional tumor information as well as assessment of nodal status combined with the anatomic localization provided by MRI yielded an improved diagnostic tool for the assessment of both primary and recurrent disease in breast cancer. Nowadays, PEM and PET-MRI of the breast is mainly performed using 18F-FDG. However, currently, specific radiotracers are being developed that will allow targeted molecular imaging of breast cancer (Pinker et al., 2011). Reviewing different available PET tracers reveals the complexity and heterogeneity of molecular pathways in breast cancer. 18F-FDG remains the hallmark of PET imaging in breast cancer, not only due to its usefulness in localizing primary and metastatic disease but also due to the constant investigation of the association between SUV values and histological and immunohistochemical factors that enables breast carcinomas aggressiveness and prognosis assessment. In order to assess patients’ diagnosis, staging and monitoring as well as to improve clinical decision making, it is imperative to combine PET imaging techniques of critical biologic and pathologic phenomena that take place, including ER, PR and HER2 expression, angiogenesis, hypoxia, apoptosis and metabolic changes in the microenviroment of breast tumors. Further clinical studies are required to improve target specificity, optimize their pharmacokinetics and compare the utility of these radiopharmaceuticals in order to determine their attributes in the various molecular subtypes of breast cancers. Novel agents and further studies in those, already established in clinical practice, would provide useful information for therapeutic effects before anatomical changes and would enable the selection of the appropriate therapies on the basis of the imaging data, making individualized medicine a reality for breast cancer patients. All the authors have participated in the writing and revision of this article and take responsibility for its content. The present publication is approved by all authors and by the responsible authorities where the work was carried out. We confirm that the content of the manuscript has not been published, or submitted for publication elsewhere.